This past June I acted in Dying City, a play by Christopher Shinn. We rehearsed during the debate on transgender rights and the so-called “bathroom bill” and performed the final show of the run the day after the deadliest mass shooting in U.S. history at The Pulse Nightclub in Orlando. As we prepared for the final performance of Dying City, I couldn’t help but consider the tragedy from perspective of Peter, the character I played. How would he have reacted? Fifty people died and forty-three were injured that night in Orlando. Would Peter reach out to friends in the LGBT community, or would he shrink into himself? You see, Peter is gay. Clearly, he is fictional character, I’m aware of that. The curtain closes and I leave him behind, returning to the privileged safe life of a straight-white-male in Montana. I have no direct connection to the horrendous events Orlando. Yet there is something of Peter that I carry with me, a flickering life that stretches my imagination and compels me to see the world from a different perspective. 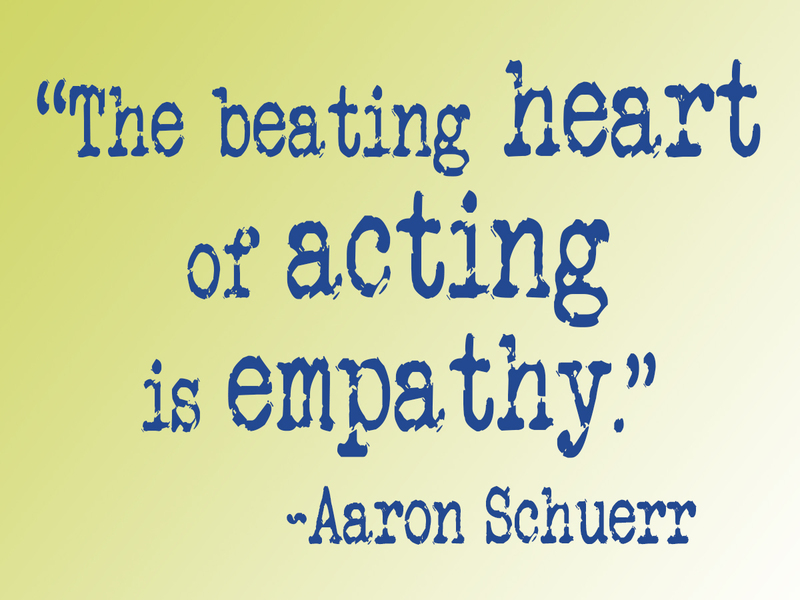 The beating heart of acting is empathy. Empathy recognizes that every character trait, whether noble or vile, resides somewhere within me. To say that Peter is a gay actor dealing with the loss of his twin brother is not very useful. That is just a label and a situation. To make him real I must find the individual. I find him in my own experiences and relationships. I look outward for clues and inward for the beating heart of the character. There is truth in the fiction. And there is fiction in the truth. We take flesh-and-blood-individuals with hopes and dreams and fears and reduce them to labels. We make fiction of what is real. There was a time when I would not have been willing to play a charter like Peter. I grew up in a very religious home. God’s design for relationship involves a man and a woman, I was taught. Homosexuality is a sin. A LGBT person has strayed from who God made them to be. If only they turned to Christ, all would be forgiven and they would be restored. I thought I could love the sinner and hate the sin. I never understood the tragedy of that. Then in college I became close friends with Sarah and Nan, an openly gay couple. (I’ve changed their names for this post.) I thought of them as I would an alcoholic, in need of help. As a Christian I had the responsibility to share the truth. They were lost, and I could help them find their way. But the reality of our friendship didn’t fit my ideology. The truth was I adored them, just as they were. Sarah was quiet and thoughtful; Nan was wry and opinionated, and they were just… gay. The idea that they could become straight seemed absurd. How could I be their friend and demand that they be something other than what they were? After finishing college, I moved to Montana and left these questions unanswered for nearly twenty years. It was returning to the stage that brought them back to the fore. One night at the bar after a performance of Amadeus I mustered up the courage to ask one of the actors for his personal story. When did he know that he was gay? Was it difficult to come out? How did his family react? I asked him the questions that I had been afraid to ask Sarah and Nan all those years ago. Since that night I’ve heard more stories, stories of pain and confusion, and ultimately of acknowledgement and acceptance. My friend David Orris spoke of the “internalized homophobia that I’d been taught.” His struggle was so profound that he was faced with “literally a decision to kill myself or to live my truth ‘just as I am without one plea.’” The pain, I realized, wasn’t the result of sin and guilt, but the result of trying to suppress the truth. A gay person doesn’t need forgiveness. They don’t need to be fixed. They just need acceptance. Acceptance starts with the willingness to listen. Two years ago, I had the opportunity to return to Scotland. I met Sarah and Nan in Edinburgh and they took me to a great little pub. They are no longer together, but they are still the best of friends. I had the opportunity to share, to hear their stories, and to apologize. It was a beautiful evening with two of my favorite people. For the first time, I could fully accept them for who they were. They don’t need labels and don’t fit easy definitions. They are Sarah and Nan. It comes back to empathy, and empathy is rooted in the human story. It is in the desire to understand a character and a story and to listen, and ultimately to share and not to judge. I never could have played Peter in a way that was true and convincing if I had not first learned to listen. To be vulnerable on stage, I must first be vulnerable in life. I had been afraid to ask questions because I thought the answers might threaten my faith. But, what kind of faith is built on fear? I am reminded of the preparation each night before stepping out on stage to perform Dying City. Marc, our director, would remind us to “listen with all of your being. Listen to each other attentively so that you respond truthfully in the moment.” Acting, I have learned, is not so much about the performance as it is about the relationships, the relationships of the actors to each other and to the audience. the audience, in turn, breathes life back into the actors. The same is true of any artistic endeavor. How do we get to a place, as artists, where we create lasting beauty? We must first be vulnerable. When I set my easel up and paint a landscape, I try to open myself up to surprise, in a way to “listen with all of my being.” Without openness, there is no growth. Without empathy, there is nothing to discover. This is as true in art as it is in life, because, ultimately, art is a reflection of life. We do it because we need each other. I am learning to listen, to acknowledge what I do not understand, and to try to imagine paths that are different from mine. Empathy begins with imagination and is compelled forward by the courage to listen without judgement. It is at the core of art and life. It is at the center of being. Note: I have to acknowledge the help of some amazing friends in giving me feedback on this post. To the Caldera Theatre Company, Marc Beaudin, Sherry Pikul, and Kori Gunderson, you truly exemplify the ideals of openness and empathy. As do David Orris and Erin Cramer- two amazing, brave and wonderful people. Click image for full photo gallery. 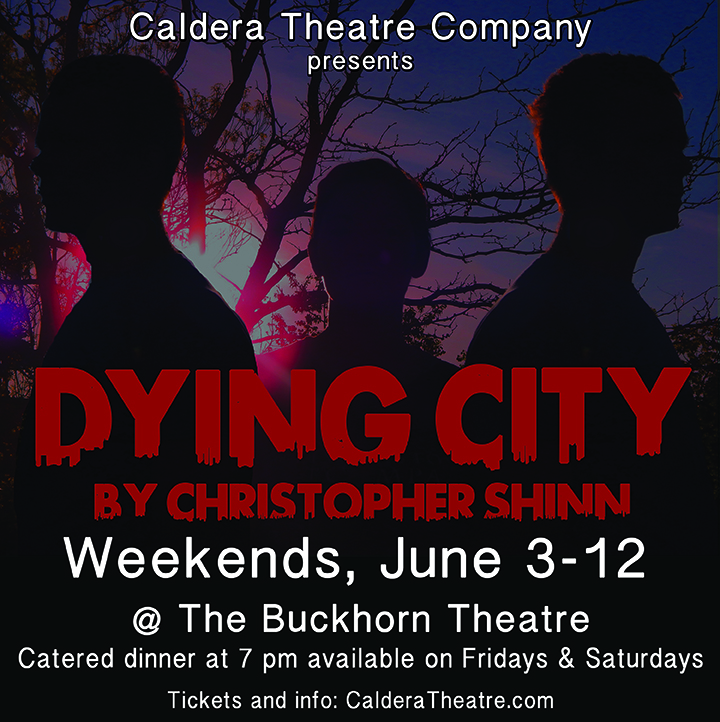 We’d like to thank everyone who came out to the Buckhorn Theatre for our production of Christopher Shinn’s incredible play, Dying City. As I say in the director’s note: the art of theatre exists not on the stage but in the moment of connection and communication between actors and audience. Thank you for making art possible. Here’s the full director’s note and a note on the set design. Amazing show! A very moving, thought-provoking production. “Phenomenal!! This is a must see for any serious theater buff, as well as anyone looking to immerse themselves in the thoughtful, intense unfolding of a story. Caldera is staking an important claim on modern theater for our savvy town and region. Go!! “Saw this play last night – twists and turns you’d never imagine – it’s a good one and very good acting. “Sherry Pikul and Aaron Schuerr are absolutely amazing in this!!!!!!!! This play is heavy duty…think Greek Tragedy meets Tarantino takes truth serum and reads all your letters and feeds it back to you replete with laughter that you may regret …or not? One thing you CAN know is that you have been served an amazing meal. Do yourself a favor … go see this one. “Beautifully well-acted, written and directed! “Livingston/Bozeman peeps: Don’t miss this superb production of Dying City. The story is powerful (Tennessee Williams meets the Iraq War), the acting phenomenal, and everything about this play makes it worth your time. 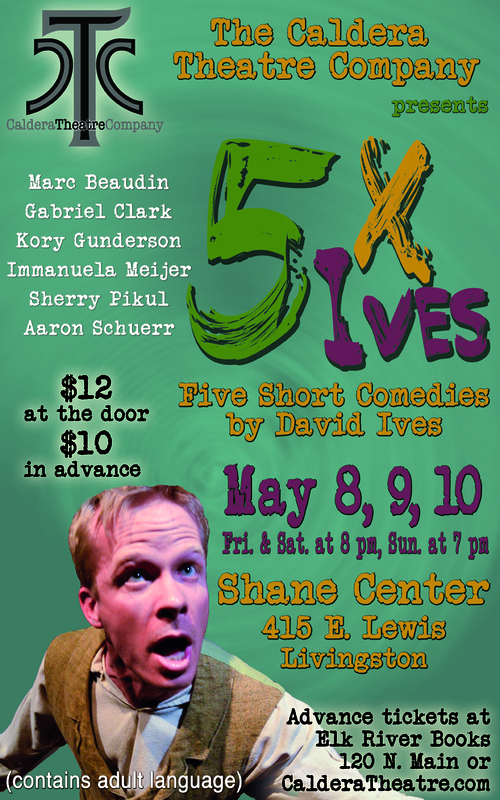 To have this kind of amazing theater production in lil’ ol’ Livingston, well that’s icing on the cake. David Abrams, author of Fobbit, wrote a great review/essay of our production, Trout Fishing in Livingston, for his exceptional blog, “The Quivering Pen.” Read it here. 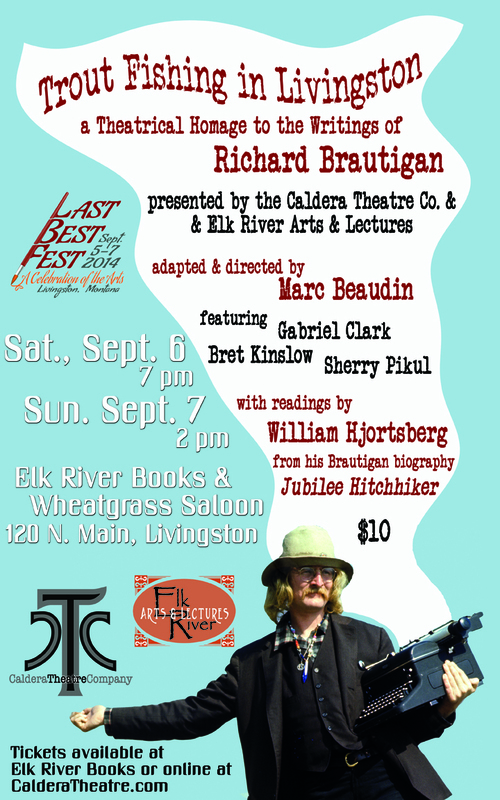 The Caldera Theatre Company and Elk River Arts & Lectures present Trout Fishing in Livingston: A Theatrical Homage to the Writings of Richard Brautigan as part of the Last Best Fest arts festival. Performances will be held Saturday, September 6 at 7 p.m. (doors open at 6:30) and Sunday, September 7 at 2 p.m. (doors at 1:30) at Elk River Books/Wheatgrass Saloon, 120 N. Main Street in downtown Livingston. Tickets are $10 and may be purchased in advance at Elk River Books or through our secure PayPal links below. Based on availability, tickets may also be purchased at the door. Culled from the fiction and poetry of one of Livingston’s most-legendary writers, the play presents excerpts adapted into a satiric and wild journey through Brautigan’s world. The production was adapted and directed by Marc Beaudin, artistic director of the Caldera Theatre Company (CTC), and features performances by Gabriel Clark, Bret Kinslow and Sherry Pikul. Interspersed throughout the play’s nine scenes will be short readings by Brautigan’s close friend and biographer William Hjortsberg, author of Jubilee Hitchiker: The Life and Times of Richard Brautigan. Brautigan lived and wrote off and on in the Livingston area from the beginning of the 70s until his death in 1984. His writings, which are darkly comical, highly imaginative and often bordering on the surreal, found form in numerous novels, short stories and poems, the most famous being Trout Fishing in America.